A nippy autumn day in the park couldn't have worked better for Montreal newcomers Seoul. This ambient pop outfit have been riding the waves of their current single "White Morning" and their breathtaking Yours Truly performance from last year. 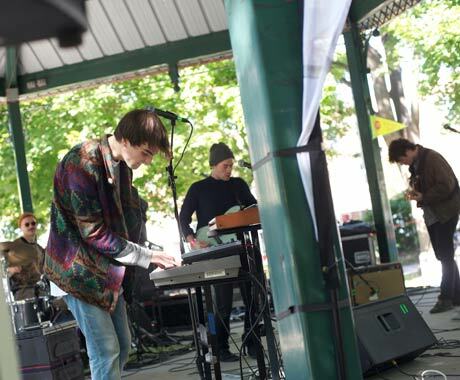 In a park filled with friends, family and impeccable fall fashion, their gorgeous live set worked in tandem with the elements, a collective effort that had the band complementing Mother Nature's breezy temperament to create the perfect fall soundtrack. Seamless three-part harmonies enticed a soft breeze to blow through their upbeat outing "Stay With Us," a track that builds off a shimmering echo and crisp beats that triggered just enough of a bop to keep the crowd gently swaying. "White Morning" got a more wistful rendition than usual, which worked to set the mood for an atmospheric noise track that left the crowd collectively flowing upstream in a sea of feels. By the end of their set, the dreamy enigma known as Seoul had manifest itself in the form of four lovable dudes that will probably be your new favourite band come 2015.